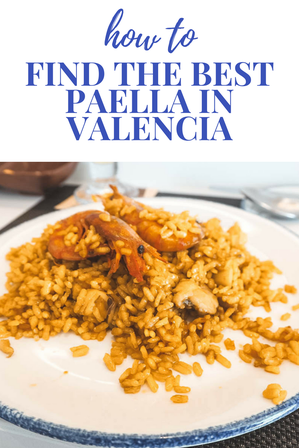 Just because Valencia is known for it's paella, doesn't mean that anywhere you go in the city will guarantee you a good one. In fact, you can actually get a lot of bad paella in Valencia. If you don't know what you are looking for it's easy to fall into the tourist-trap restaurants; places which promise a picture perfect paella with the freshest of seafood, and in reality, it's probably cooked from frozen. If you are going to Valencia, then you need to eat paella and you need to eat it right. 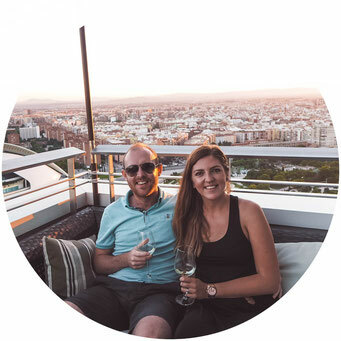 We've written this guide on where to find the best paella in Valencia, as well as what to expect in a traditional paella, our favourite paella to order and some things you need to know about how to eat the dish! so, what's actually in a paella? Golden, saffron infused rice with a crispy socarrat base, topped with succulent seafood. All served with an ice cold beer, to cool you down on a hot summers day. Does that not sounds like the perfect paella? Well, it might sound good but that's not what a traditional paella actually is. As we learned during our paella cooking class, traditional paella comes from the countryside and not the sea, which means traditional paella doesn't have any seafood in it. Instead, it has rabbit, chicken, snails (dependent on the season) and green beans. However, nowadays seafood paella is served all over Spain and locals enjoy it too! You should definitely try the traditional paella as it is delicious but there's nothing wrong with enjoying a seafood one either. Just don't ever make the cardinal sin of ordering paella with chorizo in it! 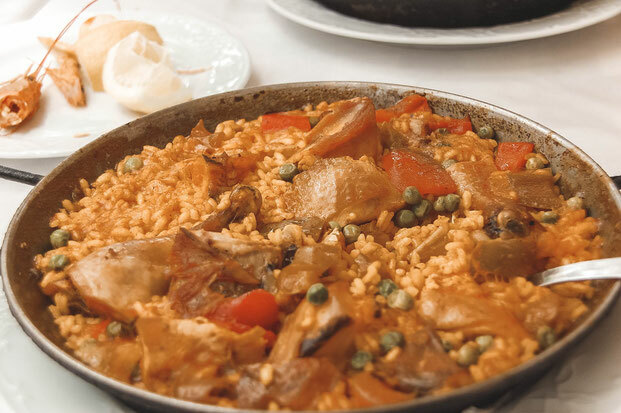 Spaniards, and particularly Valencian's, are very protective of their national dish and recently Jamie Oliver caused outrage by adding chorizo to a paella. 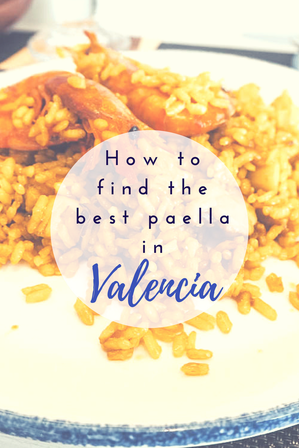 So whether you want to try a traditional paella filled with meat, or opt for a seafood version, both can be ordered in Valencia; you just need to know where to go to get the best one! If your planning on eating paella in the centre of Valencia, well, don't. We spoke to several locals and every single person advised us to get out of the city to whet our tastebuds on Valencia's best paella. We were told for the best paella in Valencia, then we had to head to the beach. The most popular beach is La Malvarrosa; this place is brimming with paella restaurants all along the length of the sand. But this isn't where you want to go. Instead, head along to the next beach called Patacona. This stretch of sand is much quieter, and it's a well known secret amongst locals that the paella is even better here. Casa Navarro - Casa Navarro is situated right on the beach, so not only do you get delicious paella but you also get a sea view. This place has been a paella restaurant since 1956, so they must be doing something right. Casa Carmela - Casa Carmela is your second option, situated not quite as far along as Casa Navarro, this place isn't actually on the beach but instead is one street back. Although it doesn't have the sea view; it's a really nice restaurant, and if you book in advance you can sit outside in their lovely garden. Casa Carmela has been making paella since 1922! This place is absolutely packed with locals, especially on a Sunday which makes it difficult to get a seat if you don't phone ahead. We had paella at Casa Carmela; there wasn't a table available but we sat at the bar and enjoyed our paella there and it was delicious! We loved watching the huge paella pans leave the kitchen, being carried over the heads of the waiting staff as they negotiated their way past all the tables. The restaurant had a lovely atmosphere so even though we weren't by the beach, we would still recommend this place! 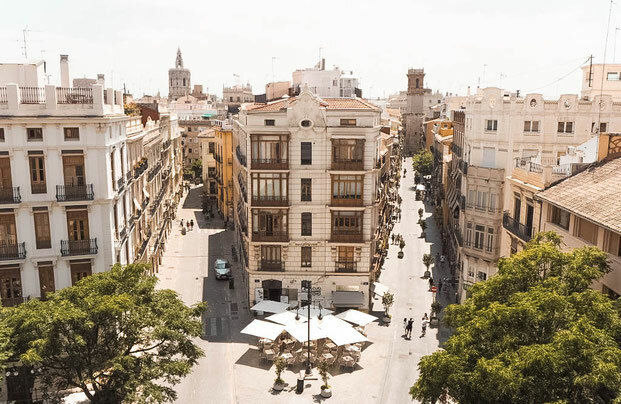 If you want to stay in the city of Valencia, then Casa Navarro and Casa Carmela are two of the best options for paella. However, if you want to taste the best paella you will ever taste in your life then you need to head to the town of El Palmar. El Palmar is a little town only a 30 minute drive from Valencia, and was the birthplace of paella. Located in the heart of the Valencian countryside and surrounded by rice fields, it's not surprising paella was created here. 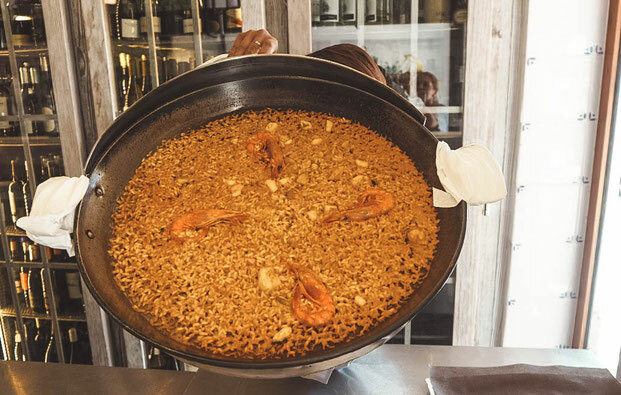 Almost anywhere you go in El Palmar will offer you an incredible paella, however there is one place which we were told is better than all the rest. L'aqueria del Brosquil is a family-ran, local restaurant located a little outside of El Palmar, in an even smaller village called Castellar. It's only a 5 minute drive from The City of Arts & Science so a taxi is probably the easiest way to there, although it is walkable as well. This restaurant opened in 2008, and although not as old as some other paella eateries, it quickly became a popular place for locals to visit for traditional Valencian food. 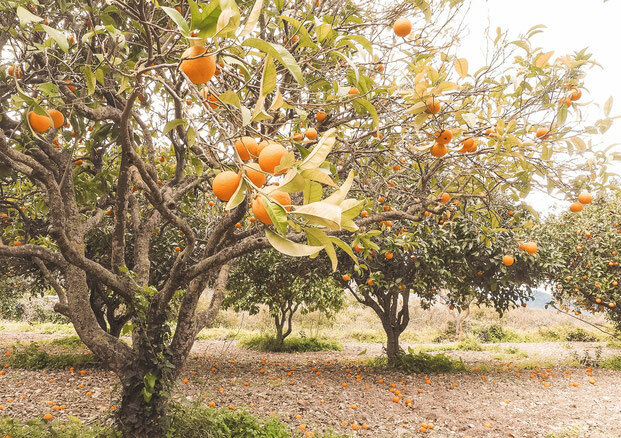 The restaurant is a converted farmhouse situated within an orange grove, the views are stunning and the paella is arguably the best you will ever taste. Another great thing about it is how affordable it is; they only charge €10 per plate of paella which is much cheaper than some of the overpriced places along the beach or in the city. It is difficult to get a table here at lunchtime so make sure to book ahead, and if your not confident in your Spanish then simply send them an email to reserve. what's the best paella to order? The best paella to order is completely subjective; it depends on you and what you like. There are over 3000 different varieties of rice used for paella, as well as lots of different protein and vegetable combinations so the choice is endless. However, there are a couple of paellas we would recommend that everyone should try. Firstly, the traditional paella of Valencia. As we mentioned earlier, this isn't a seafood paella but instead has rabbit, chicken, green beans, rosemary and sometimes snails. Until we went to Valencia, I had only ever tried seafood paella (I assumed this was the traditional one!) and I wasn't sure how I would find one without seafood in it. But I was pleasantly surprised, because of the way the paella is cooked with the meat, there is so much flavour in the rice. 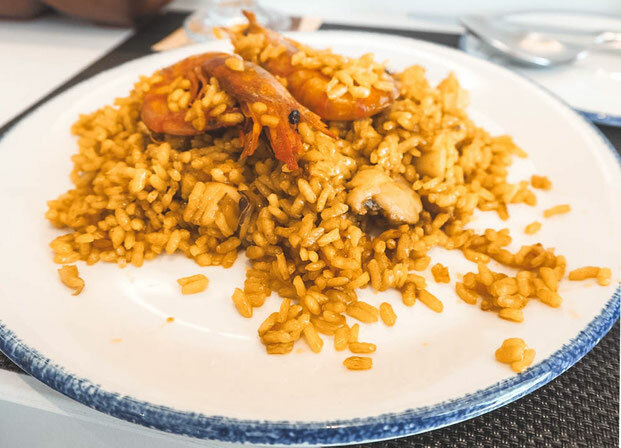 If you are looking for a seafood paella, then our favourite one is Arroz de Senyoret, which translate as The Little Gentleman's Rice. Aside from being a cute name, this paella is served with all seafood already de-shelled. So, like a gentleman, you don't need to get your hands all dirty and if you are like me, end up with prawn shells all over you. Instead, it is all prepared for you so all you need to do it eat and enjoy! There is a certain etiquette when it comes to eating a paella; if you are eating with a Spaniard then you need to follow the rules otherwise you run the risk of being banished from Spain (maybe a little dramatic, but they do take it seriously!). When sharing paella, you can never turn the pan. Once the paella has been placed on the table; the portion of the paella in front of you is yours. Even if another part of the dish looks better, you cannot take from the other side of the pan, nor can you turn the pan around so the bit you want faces you. It's in the hands of the paella gods, and you need to eat whatever side you get. However, you can trade. Despite not being allowed to take from another side the pan, you can bargain with your fellow paella eaters. If, for example, you want a prawn but you didn't get a prawn on your side, you can offer to trade something you have. If you follow these rules then you will be a good paella companion and you will be invited out for more paella, however break these rules and you may not be allowed to eat paella with a local ever again! Paella is a delicious dish and one that Spaniards are proud and protective of. What was once a humble dish created by farmworkers has become Spain's national treasure that is enjoyed by locals and visitors alike. If you are visiting Valencia, then you must try a paella from this region and it may be the best one you ever taste.